Tell me a little about your upcoming Kickstarter. What's exciting about it? It is a follow up to the successful launch of Edara: A Steampunk Renaissance. This campaign companion delves even deeper into the world we created, offering more maps, adversaries, background and historic information, NPCs, and plot hooks so that GMs can bring their parties deeper into the world. What did you do to develop this new material - what kind of preparation did it take? Well it took a lot of work to develop, honestly. We had to really study the cultures we wanted to base our world on. We worked with an Economist to figure out how money would work passing between nations in a world like ours. I teamed up with a latin and classical cultures major to fully flesh out the details of the culture, down to the histories, traditions, politics, and day to day lifestyle. Tell me a little about the plot hooks. What were you looking for in the plot hooks? So this ties in a lot to the plot hooks. The biggest themes of our game are the conflict between science vs religion, renaissance vs steampunk, and the inherent racism that comes with a mult-racial fantasy world. In the corebook, we basically said here are the themes, you can build your games around these. But the plot hooks dig deeper into that. We focus on each realm individually (and some of the bigger realms are divided into regions, or even down to cities) in order to provide these hooks. They aren't fully fleshed out ideas or adventures, just hooks to help the GM build a campaign. The types of adventures that one might go on. For example, in the human kingdom of Kuria, which is broiled down in political disputes, the plot hooks have to do with one house playing the party against the others. There is also a racist movement inside the kingdom that might attempt to use the party to act out against the other races, which puts the party in a tough position as they have to decide what is more important to them: appeasing their employers or breaking the cycle of racism that has built up in the kingdom after years of war. Meanwhile, in the Dwarven kingdom, the plot hooks are more adventurous; exploring new tunnels and ruins to find lost dwarven treasures, or escorting merchants while they sell their wares above ground. Tell me more about the cultures you based the world on. What kind of characters and cultures will we see? Well we have several cultures spread across the world. The humans are actually based on medieval culture with Italian Renaissance flavors. Then we have the orc mountains which is based more on nomadic Mongolian aspects with a high focus on honor. The elves are rooted more in Tolkienesque fantasy and an almost pure socialist society. So there is a lot of variety! Is this the last we'll see of Edara, or is there more to come? If there is more - what should we be excited for? And no this is not the last! We plan on offering future books in this line focusing on parts of Edara that we haven't seen yet. There will be this same amount of focus and death on the areas beyond the mountains and forests, which we will talk about more as time goes on! This book will lead right into the future timelines of Edara. The Nefertiti Overdrive Kickstarter hits today! Keep an eye out. Tell me a little about Nefertiti Overdrive. What excites you about it? While I can sometimes be more interested than is good for me in the specific details of a historical setting, I can also really appreciate a story that purposefully disregards the facts and focuses on the fun. I am unapologetic in my love for the movie the 13th Warrior and happily sit through the Scorpion King. These movies take historical settings but then don't sweat too much in favour of presenting a fun and exciting story. That's what I've done with Nefertiti Overdrive (first clue: it's not even set during the time of Nefertiti, I just though the title sounded cool). Then I added physics-defying action with mechanics that reward exciting and detailed narratives of character actions. In Nefertiti Overdrive, you can still say "I punch him in the face," but you won't get rewarded for that and could easily fail. If you say "I leap up, flipping over my opponent and landing behind him. I then swing back with my elbow, cracking him in the side of the head." That will not only make it easier to succeed – because it's pretty cool – but you can also earn Luck – a kind of Hero Point/Plot Coupon/Benny – from other players if you do something they really enjoy. This all excites me because it amps up the energy at the table, players trying to outdo other players with their descriptions. It rewards creativity and creates a really strong, cooperative table dynamic that has always led to a really fun game in my experience. This is the kind of game I love to run or play. What sort of mechanics do you use in the game? Any time the dice hit the table in Nefertiti Overdrive, it's called a Test. PCs have four attributes that provide dice. Each Attribute has two Qualities – a descriptive word or short phrase like 'Protector' or "Loyal to the House of Kashta.' Each Attribute also has two die-types associated with it, the lower being the base die and the higher being the max die. If you can apply one of its Qualities to the scene, the Attribute provides its base die. If you apply the Quality in a narratively exciting or interesting manner, you can use the max die. Dice are compared for Initiative (which character is active and which is passive), Target (does the active character overcome the passive character for a Triumph), and Effect (can one of the character's impose a penalty – known as a Condition – on the other). Each Challenge has a number of Triumphs required to overcome it. Tell me more about Luck. What can you do with it? With Luck, you can add an extra Quality – meaning you can roll five or more dice in a Test and use them all – re-roll a die, or remove some or all of a Condition – a penalty that can be imposed during a Test. Luck is provided by players to other players, and there is a limited supply. When a player uses Luck, it goes to the GM, who can use it to buy a natural 1 rolled by a player and add that die-type (though not the die itself) to a Threat Pool. The GM can add any die from the Threat Pool to any Test, but it can be rolled only once and is then removed from the Pool. When the GM spends Luck, it returns to the pot, available to be distributed by the players to other players. When a player or GM has extra dice, she can apply those in whatever fashion she feels is best, to increase Initiative, Target, or Effect. This generally means an amazing result, which might lead to more Luck from players. It's the circle of life! How are you preparing for the Kickstarter, and what kind of cool stretch goals will we see (if any)? The Nefertiti Overdrive Quickstart rules are already available (http://rpg.drivethrustuff.com/product/137307/Nefertiti-Overdrive-Quickstart-Rules) and were released in the hopes of creating some interest in the Kickstarter. I have an agreement with Magpie Games to facilitate shipping, which takes a huge load off my mind. Magpie Games fulfilled my last successful Kickstarter, Centurion: Legionaries of Rome, and it makes a huge difference in regards to the period between having the book printed and getting it into the hands of our backers. The text for the game is 75% finished, and we have about half of the artwork in hand. The first stretch goal is going to be maps for the included adventure. I'm trying to present a very realistic goal for the Kickstarter, but that means I won't be able to afford maps. The plan is similar to what was done in the Quickstart – suggestions for image searches and a link to an existing map or illustration available on the internet at the time of publishing. I would really like to provide maps for the included adventure, but I believe $3,000 Canadian is more realistic than $4,500, but if I can get the latter, the adventure will get maps. After that, at $7,500, we'll include another setting I'm calling Daredevils of the Water Wastes. Part of Nefertiti Overdrive is a scenario creation system that can either be done as a kind of game or just as a framework for brainstorming. It allows the players to create the kind of campaign and setting in which they want to adventure. Daredevils of the Water Wastes is a product of that system, and uses the same mechanics as Nefertiti Overdrive, but with slightly altered Attributes for the player characters. We have other stretch goals planned, and will reveal those as we knock these one's down. Yes, I am exactly that insanely optimistic. It could happen! Season 3 of Standard Action goes live TODAY! Check out the webpage at http://www.watchstandardaction.com/. Sorry for posting so late - illness and such got in the way. Tell me a little bit about Standard Action Season 3. What excites you about it? Season 3 joins our heroes a few months after season 2 has ended. First and foremost we answer the question everyone has been demanding to know.. What happens to the Efreeti head in a bucket after the party abandoned it in the forest? Season 3 has a lot of interesting things going on in it. We can look forward to many guest stars from other web series including Transolar Galactica and Journey Quest. We will get to see a few old faces from season 1. We also get to find out more about Ikosa and who she is. The Rogue, Gary joins the party to help them on their quest to find Martin the Druid as he has been lost in another realm of existence. I'm really excited to be launching the card game and Pathfinder module for Standard Action. 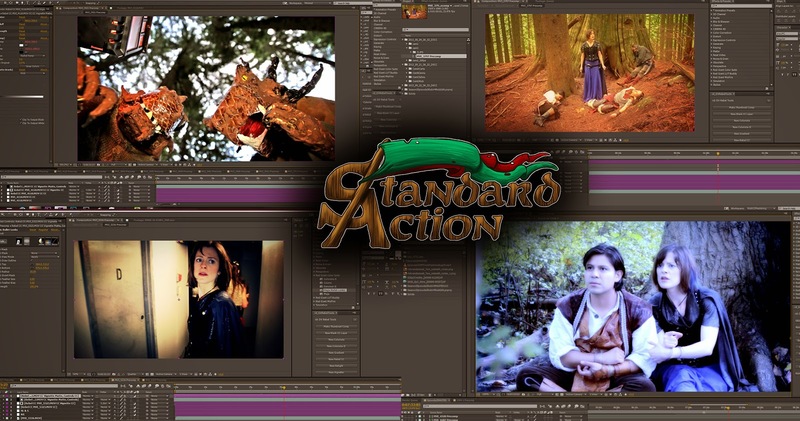 Both projects help expand the Standard Action world and are part of our season 3 Kickstarter. The card game is a simple party building game where each player builds a party of heroes and goes on adventures. Torvel can betray his party every round! Slay baby eating kobolds! The Pathfinder module explores the adventures of the party between season 1 and 2. As they try and identify a magic bracelet and how it ended up becoming a taxidermied squirrel by season 2. Take your role playing to new heights with encounters like, the fashion show! A taxidermied zombie shark with a wand of magic missile on it's head! Kobolds! Finally, as post production guy, I really enjoyed doing different looks for some of the different alternate realities they visit. I started that a bit with the office portions of season 2 being silvery and desaturated. I got to do looks for a dream world, a musical world and a science fiction world. It was a lot of fun working on that. What characters are we going to see the most of this season, and why? Well, we ended Season 2 with Edda, Fernando and Wendy whizzing off into the planes to go looking for Martin, and taking a very surprised Rogue with them - Gary, played by David Pearson. We're definitely going to be seeing a lot of those four characters, but fans will be pleased to know that they certainly haven't seen the last of Martin the Druid, who has been with us since the beginning. We're also coming full circle a bit on this season, so fans will see a lot of the faces they saw back in first season reappear. Jaina the Bartender will show up again, for instance, as will Cedric the Wizard, who has always been a fan favourite. What did you have to do to prepare for the new season using the Kickstarter funds? This season has certainly been our biggest yet. The script was a little more ambitious, including five different sets that had to be built in the same small space. We had a lot more cast to deal with as well, all of whom had to be costumed, and some of whom were special guests being brought in from out of town. We upgraded equipment and added a slider and some better tripods to the mix, as well as a better sound recorder. The musical carried a few of its own expenses, developing the songs and lyrics, and booking the studio time needed to record. As always though, our biggest expense is labour, so we put aside a lot of that Kickstarter money to fund the actual production. We had to bring a few more people to set this year to deal with the complexity of our stories, and we try to pay everyone as best we can. Tell me about the music for this new season. Who all do you have on the project? The music for the new season is a wonderful concoction of both effects-driven samplers & synths with big delays, reverbs, and even reverse effects, and recordings of acoustic instruments. The fantasy element of "Standard Action" allows us to bend the rules of classical orchestration, leaving the opportunity to build an assortment of instruments that are processed in unconventional ways, such as tribal drums, glockenspiel, or celeste with heavy reverse delay & reverb, or even ring-shifters. That being said, it is still important to incorporate acoustic elements that play an important role in the show's setting, and overall mood. I'm using a fair bit of mandolin, acoustic guitar, acoustic-slide guitar, and even banjo for this season's score. Yes, even banjo! It is also important to change orchestration based on setting, and circumstance in a scene. For example, in Episode One, the team is aboard a space vessel in another plane, in a galaxy far, far away. So you'll hear that classic, familiar sound of a theremin in there. In more-comedic scenes with Cedric, for example, staccato notes, chromatic runs, and instruments with short decay may help push the goofy mood along. The writing is strong, and a huge part of the score is also knowing when the dialogue can speak for itself, and not being too obvious or suggestive that the audience "should" feel a certain way, by shoving music in their face. Lots and lots to consider with score! This season's post-production schedule has been arranged to have enough time to really polish each episode off, down to every last little detail, so I'm really thankful to be granted the opportunity to experiment. Joanna has been pretty good about making sure that I'm on the right track. Like with any collaboration, things can be up for interpretation, so it's fun to find out that we've had different takes on what certain scenes might need for music. For example, the first scene of Episode Two was intended to be dramatic with a darker tone, but wacky, maniacal, lighter music actually really sold the scene. There is a musical episode this season! Our cast did vocal training with Camille Johnson, who wrote a number of songs for the musical episode. She laid down a piano scratch-track and we worked out what the tempo would be for each section, and where all the pauses would be, and then we brought everyone into the studio for one massive vocal session. It was amazing. Everyone had such a fun time and really shone. Some of the cast came from a musical background - even opera trained! - and others hadn't had much experience at all. Camille & and the cast did SUCH a great job. After all the vocals were edited & mixed, the scratch tracks were then built into these large orchestrations to sound totally Disney-esque. That episode is a standalone, for sure. This season is the biggest, by far. Everyone has grown, professionally, and people are constantly upping their game; more complex writing, more elaborate costume design, more sophisticated visual effects, longer episodes, more tools and toys. It is so amazing to be part of a team of such eager, hard-working and friendly folks. Joanna is such a strong leader who fully understands that this is entirely a team effort. She knows how to step back and trust people to handle things, and allow them the space for their talents to shine, while also being able to pull things together and be our general. Season 3 Episode 1 launches on Nov.18th - Get ready for it. 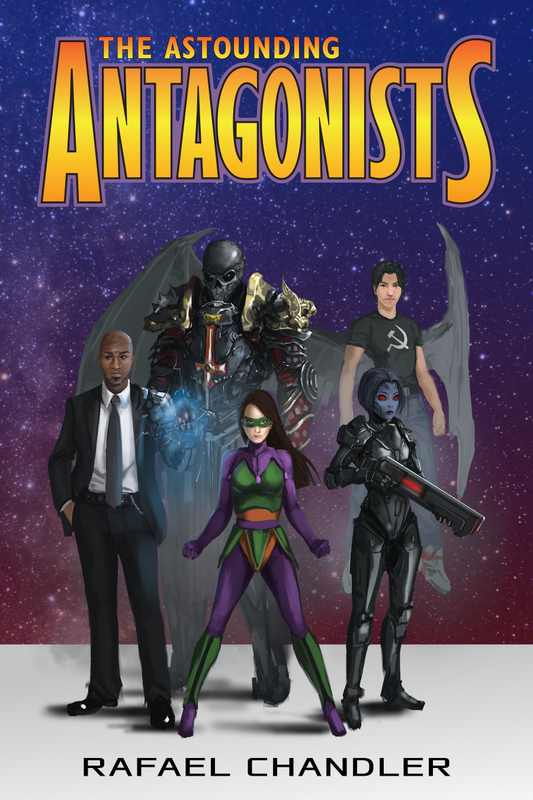 What was your inspiration for The Astounding Antagonists? In comic books and films, people with superpowers commit violent acts in the name of justice. A while back, I started thinking about heroes, and how they might be designated as criminals or villains if their idea of 'justice' differed from the status quo. And the novel emerged from that idea. Are these characters antiheroes, true heroes, or just freakin' awesome superheroes, and why? In the novel, they're referred to as villains, and they embrace the term, because they steal, destroy, and kill. However, they believe that their actions are justified, so they do see themselves as heroic. Tell me a little bit about Helen Damnation! She's an blue-skinned extraterrestrial who wears a suit of high-tech armor developed by Dr. Agon. It turns out that the armor doesn't do what everybody thinks it does. Helen is somewhat contemptuous of any society that values material wealth. She likes dogs. She enjoys sweets. She's fiercely loyal to the people that she loves. Though she will not kill, she enjoys combat, and is quite proud of the scars that she has earned. Your RPG work is known for being a little gore heavy. Is it the same with this work? It's not particularly gory. Like my previous novel (Hexcommunicated), this is a fast-paced adventure. There's some violence, and if it were a movie, it'd be rated R -- but it's nothing like the splatterpunk work I do in RPGs. What's up next for you, post-Astounding Antagonists? I'm working on the second book in the Agent Tepes series; it's called Hextermination, and it features shoggoths, ghouls, and witches. Should be fun! Also, I'm nearly finished with my kickstarted monster manual, Lusus Naturae. Very excited about that.